Bars are always a real hot spot of paranormal activity. You mix human nature with alcohol and you usually get a bunch of drama and, as we know, drama is the mother of a good haunting. Dark and filled with stories, some patrons just refuse to leave – ever! These locations will give you an extra shot of spirits that won’t appear on the tab. Usually fun and mischievous, bar flies in life are like that in death and just can’t bear watching the party end. 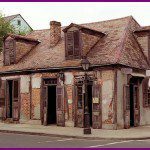 Lafitte’s Blacksmith Shop – Built before 1772, this original building has withstood fires and hurricanes and has history tucked into every nook and cranny. 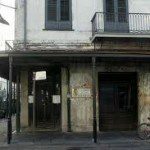 Once the front for the notorious pirate brothers Lafitte, it has now been a bar for many decades. I have spent considerable time here and the rear of the building has an excellent history of paranormal activity. Colder and clammier than the rest of the bar, it is a breeding ground for dark shadows to scoot about scaring patrons and staff alike. 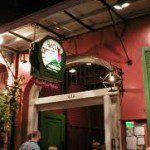 Pat O’Brien’s – Once a Speakeasy during prohibition, this circa late 1700s location is one of the most famous bars in town. Recognizable around the world for its world famous “Hurricane” cocktail, there are more spirits mingling here than in the drinks. The piano in the piano bar has been known to play on its own and you can hear the faint steps of tap dancing Eddie, a server who entertained until he died. Also, the upstairs ladies room has an attendant who just won’t quit. 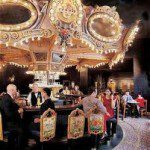 The Carousel Lounge – The haunted Hotel Monteleone has a haunted bar as well. The bar itself spins which sets a good tone for the paranormal. Add to that the dark and secluded lounge and you have all of the ingredients for a full round of haunting. Ghosts love laughter and there is always a lot of fun happening here. 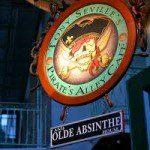 Pirates Alley Café and Absinthe House – This haunted bar stands today on the site of the former Spanish Colonial Prison of 1769. Located on Pirate’s Alley around the corner from St. Louis Cathedral, this area is drenched in the cold hearted drama that makes New Orleans so haunted. Just mere feet away from land used for public hangings and duels to the death, this location draws spirits like moths to the flame. Plus, the absinthe doesn’t hurt either. 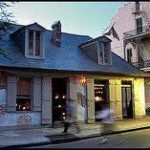 Napoleon House – A former mayor’s home, it was rumored to be intended to house Napoleon Bonaparte. While it never was, it is a well loved location that seems to have a few patrons who enjoy sitting in the windows and watching the living stroll by. Sipping on wine while listening to opera as the river breeze brushes your cheeks, it’s easy to see why spirits would like this haunt. 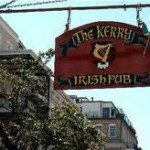 Kerry Irish Pub – Decatur Street runs along the river where much trouble brewed. As long as you had boatmen and money and women and booze, unpleasant events are likely to follow. Here patrons and staff often hear eerie sounds, bodiless voices, and footsteps behind them. There are also many cold spots to help chill a pint of Guinness. 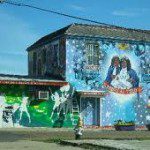 Ernie K-Doe’s Mother-In-Law Lounge – Off the beaten path, where one should take a cab, can be found one of the funkiest little haunted bars in New Orleans. Once owned by the late Ernie K. Doe, famous for his hit record “Mother in Law”, his widow dutifully kept this bar alive until her recent death. This lounge was their entire universe, where musical magic occurred nightly. Their presence was so strong in life that it lingers here and they still manage their night spot. Currently operated by the late Antoinette K. Doe’s daughter Betty, it is the perfect place for a paranormal experience if you can get there when they’re open. Call before you go. Bacchanal – This is another cab ride away but well worth the trip if you are a paranormal explorer. 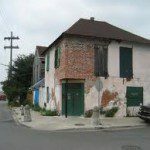 Set on a far corner of the historic Bywater neighborhood, this is the oldest building in an area that was once a hubbub of activity along the docks of the Mississippi river. Many weary souls crossed its threshold and you can feel it in the ambience of the bar. Other paranormal fans feel that it is an area of high paranormal activity because of experiments that were conducted at the naval base across the street. Either way it is both hair and glass raising.